BRISTOL - They call it “hoods off” mode, a mentality that began last spring. 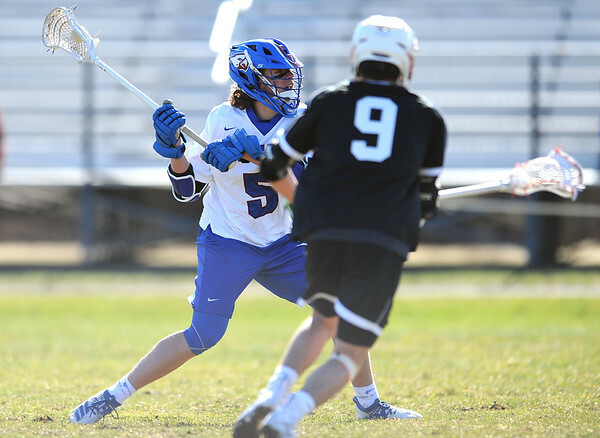 Leading into his third season as head coach, Chris Kennedy knew something special was happening in his St. Paul boys lacrosse program, and he was fired up before the Falcons took the field for their 2018 season opener against Wolcott. In an impassioned pregame speech, Kennedy detailed the process of how falcons are trained - hoods being thrown over their heads to control their sight so they can only see their trainer. As young people, Kennedy said, the players are often wearing a metaphorical hood to act in a way that pleases their parents, school leaders or other authority figures. Apparently, the speech worked. The Falcons went out and dominated in a 15-0 win, and ever since that offensive explosion, they have been on the prowl, making quick work of most of their opponents. With the full-throttle attack as its identity, St. Paul exploded for an 18-2 campaign highlighted by a regular season conference championship, a conference tournament title and a trip to the state quarterfinals. The success was all jump-started by the Falcons’ high-octane offense. Kennedy guided St. Paul to a 19-19 combined record over his first two seasons. Ashworth was a freshman on Kennedy’s first team, and Tucker Raymond joined as a freshman the following year. Kennedy knew both were special players, but there was a key component missing. They needed another scorer. The coach’s son came to the Falcons last season as a freshman, and he helped take the offense to a new level. The addition of another lethal weapon gave St. Paul a three-headed attack “that could score from anywhere in the field,” Chris Kennedy said. Brycen Kennedy, Raymond and Ashworth finished last season ranked No. 1, 2 and 3, respectively, in the state in points. Kennedy and Raymond finished No. 1 and 2 in goals scored, and Ashworth ranked sixth. All three finished in the top 10 in assists. It all added up to a 17.3 goals per game average, the No. 1 mark in the state. It starts with what Raymond touched on: Chris Kennedy’s loose environment and free-flowing offense that allows the players to let the shots fly. Don’t expect any changes this season, especially not after back-to-back wins over Amistad (16-1) and Watertown (14-1) to start the season, the latter coming on a Wednesday afternoon in which Kennedy (six goals, three assists), Raymond (three goals, two assists) and Ashworth (four goals, five assists) each had their fingerprints on a dominant victory. One of the eye-popping plays against Watertown came when Ashworth linked up with Kennedy on a behind-the-back pass, and the sophomore lined up a shot and catapulted it into the back of the net. It was a perfect microcosm, Ashworth said, of the relaxed persona these Falcons enjoy. The Falcons’ success starts with their offense, but is bolstered by a defense that allowed just five goals per game in 2018. That trend continued against Watertown, as the Indians had to scrounge for any shot attempts, finishing with just four total attempts and the one goal that came during a man-up advantage. The schedule is about to ramp up its intensity right away, however, and that defense will attempt to lock down some of the state’s best in East Catholic, Northwest Catholic, defending state champion St. Joseph (which defeated the Falcons in the quarters last season) and Bacon Academy, which comes to St. Paul for a 5:30 p.m. tilt Saturday. As the calendar turns to May and June, the Falcons (2-0) will almost certainly have to face the state’s perennial powers, something Chris Kennedy is hoping his program will soon become. In order to earn that distinction and respect, though, it might take raising a banner to get there. And that’s something each Falcon is starving for - a state championship. Posted in The Bristol Press, St. Paul on Thursday, 11 April 2019 21:34. Updated: Thursday, 11 April 2019 21:37.